The purpose of all the trips to Las Vegas is to visit the children and the grandchildren that live out there; at the expense of gambling and nightlife. Of course we also have to work around the work schedules of the children, as work schedules in Las Vegas are more elongated and mostly oblivious to holidays, let alone the concept of weekends. I was very fortunate to have lunch with my son, while my Bride went off with the girls to have Sushi. We went to a restaurant near the casino we were staying at, and which we have gone to a couple of times before. We went to View Wine Bar & Kitchen in the Tivoli Village complex and over the years I watch the progress of this complex, until completion and now I am watching the second phase of construction. We started off with a Charcuterie plate for two and it was a mix of Prosciutto, hot copa, olives, pickles, pesto and an assortment of mustards. We then we ordered a couple of sandwiches that we split between the two of us. One of the sandwiches was a grilled Beer Bratwurst with Cotswold Cheddar and it was excellent. The other sandwich was hot Pastrami with sautéed onions and garlic, Red Dragon cheese on a toasted Brioche, and it was great as well. We were just catching up and having some good conversations and we were full by the time the lunch was over. Alas, for my son, he had to go to work after our lunch, so he was not able to partake in a cocktail, beer or a glass of wine. 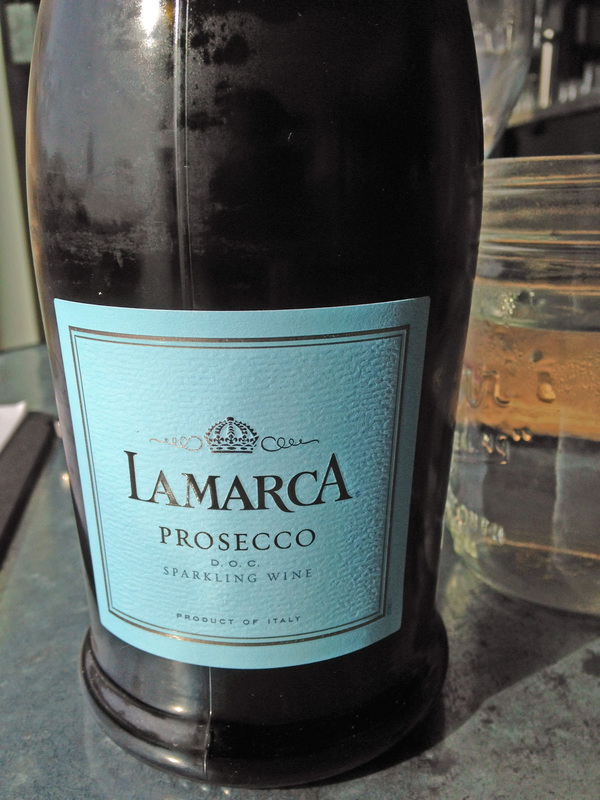 I on the other hand started of with a glass of La Marca Prosecco DOC NV. The wine is named after the La Marca Trevigiana zone in the heart of the Prosecco region of Italy. This wine was listed as being one of the “Top 100 Wines of the Year” by Wine Spectator magazine in 2007. Since this wine is from the Prosecco DOC region it is listed as using the Prosecco varietal, instead of the other name of Glera. 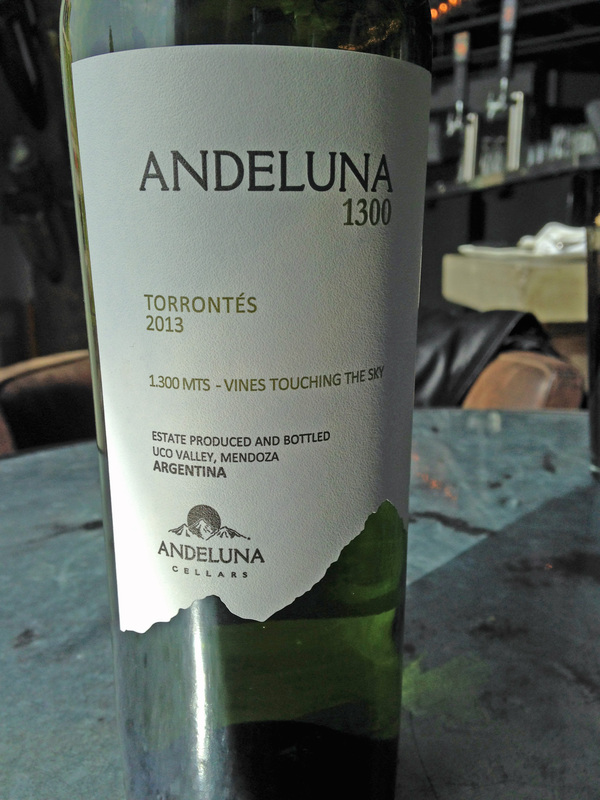 The other wine that I had during lunch was a glass of Andeluna 1300 Torrentes 2013, a charming white wine. There is the potential of this wine being a blend of three different Torrentes grapes of the region; Torrentes Sanjuanino, Torrentes Mendocino and Torrentes Riojano. Torrentes is becoming the signature white wine of Argentina and especially Mendoza, which is the largest wine region in the country. I was sad to see the lunch end, and my Bride told me that she would have preferred having lunch there, than the Sushi that she had. This entry was posted in Dining, Wine and tagged Andeluna 1300, Argentina, Glera, Italy, La Marca Trevigiana, La Marca Winery, Mendoza, Prosecco, Torrentes, Torrentes Mendocino, Torrentes Riojana, Torrentes Sanjuanino. Bookmark the permalink.